On September 26th, V4A held the first "Building Momentum Together" Speaker Series event. This event was held at World Trade Center in Clayton with St. Louis Mosaic Project as our host. 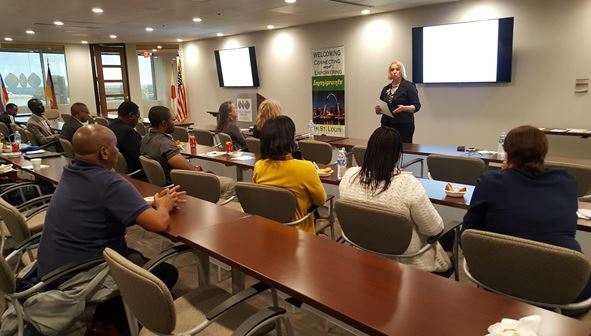 This gave immigrants professionals an opportunity to know more about Mosaic project and other services offered by St. louis economic development partnership. Dr. Nhial Tutlam, Chronic Disease Epidemiology Manager with St. Louis County shared past experience as a refugees in Kenya and in USA. The Kenya Mission team lead by Sally Gacheru, Hazelwood High School Students shared their experience in Kenya this August where they did a service project. Building Momentum is a V4A speaker series, where immigrants and refugees from diverse background meets to engage and empower each other. This program aims to highlight the achievements and economic impacts of immigrant and refugees in the St. Louis community. Speakers who are either immigrants professionals, entrepreneurs or students share their own personal experience, and how they change it into opportunities. The forum also helps to bridge immigrant leaders with emerging youth leaders. The next forum is January 16th, 2018 at the same location.